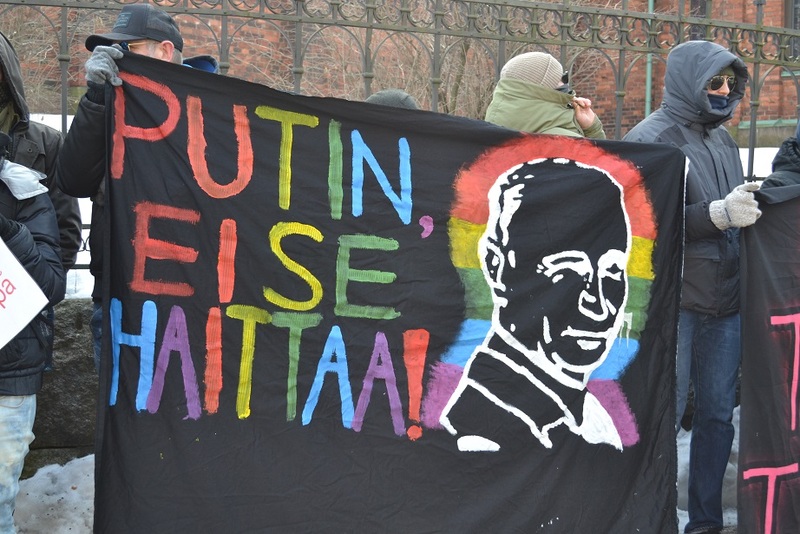 On March 18, 2018, as part of an international solidarity campaign with Russian antifascists and anarchists, there was a protest in Helsinki near the embassy of the Russian Federation. More than 50 people gathered a few dozen meters from the embassy. In the hands of activists there were banners and posters in English and Russian: ” FSB OFFICERS ALWAYS achieve their goal –through torture, forgery and bullying “, ” Politzekam Freedom, Putin to prison!”, ” Freedom for anarchist Eugenia Karakaševu “, ” Freedom for all political prisoners “, ” Fsb is the main terrorist “, ” Putin, no thank you!”. ” for our and your freedom “, ” Putin’s gang in court “, ” Putin on nara – boys on canaries “, ” above, above black flag, state main enemy “. There was also a distribution of leaflets explaining the reason for the protest near the embassy, where a vote was taken on 18 March for the new president of the Russian Federation. Several hundred leaflets were distributed, the reaction was different, some of the people supported our demands, took leaflets, honking cars, other “designed” Russian government propaganda negatively and sharply reacted to simple demands of freedom for our fellow anarchists and antifascists, for them freedom is not so important like the “Television power” of the putinskogo regime. It was a little surprising that at the beginning of the demonstration, about ten Finnish nationalists came and then withdrew, apparently realizing that they had nothing to win in this situation. In general, the action was positive. Anarchist Black Cross Helsinki, antifascists and anarchists from RF, March 18, 2018. Next post: #Brussels Demo March 21: A roof for everybody!